Hadavand Mirzaei, H., Hasanloo, T. (2014). Assessment of chemical composition of essential oil of Ferula assa-foetida oleo-gum-resin from two different sites of Yazd province in center of Iran. Research Journal of Pharmacognosy, 1(2), 51-54. H. Hadavand Mirzaei; T. Hasanloo. "Assessment of chemical composition of essential oil of Ferula assa-foetida oleo-gum-resin from two different sites of Yazd province in center of Iran". 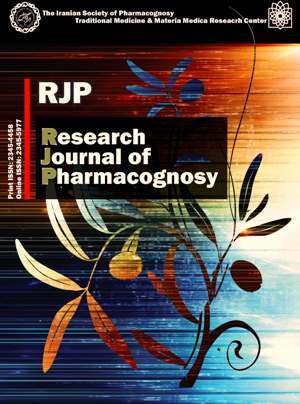 Research Journal of Pharmacognosy, 1, 2, 2014, 51-54. Hadavand Mirzaei, H., Hasanloo, T. (2014). 'Assessment of chemical composition of essential oil of Ferula assa-foetida oleo-gum-resin from two different sites of Yazd province in center of Iran', Research Journal of Pharmacognosy, 1(2), pp. 51-54. Hadavand Mirzaei, H., Hasanloo, T. Assessment of chemical composition of essential oil of Ferula assa-foetida oleo-gum-resin from two different sites of Yazd province in center of Iran. Research Journal of Pharmacognosy, 2014; 1(2): 51-54. 1Department of Molecular Physiology, Agricultural Biotechnology Research Institute of Iran (ABRII), Karaj, Iran. Medicinal and Natural Products Chemistry Research Center, Shiraz University of Medical Sciences, Shiraz, Iran. In this experiment, the chemical composition of the essential oils obtained from Ferula assa-foetida oleo-gum resin collected from two different sites of Yazd province (Tabas and Yazd) in the center of Iran, were identified. The gas chromatography mass-spectroscopy (GC/MS) data showed that the qualitative composition of the components appeared to be constant in two different regions. Moreover, no remarkable variations were found in the amounts of the essential oil major constituents. A total thirty-nine components, comprising 91.52% and 95.61% of the total oil, were characterized in Tabas and Yazd samples, respectively. The hydrodistilled oils contained E-1-propenyl sec-butyl disulfide (40.15 and 44.36% in Tabas and Yazd samples, respectively), Z-1-propenyl sec-butyl disulfide (23.93 and 27.98%), Guaiol (5.50 and 3.14%) and Carotol (5.14 and 1.63%) as major constituents.